Going From Four Fundraisers, to ONE a Year! 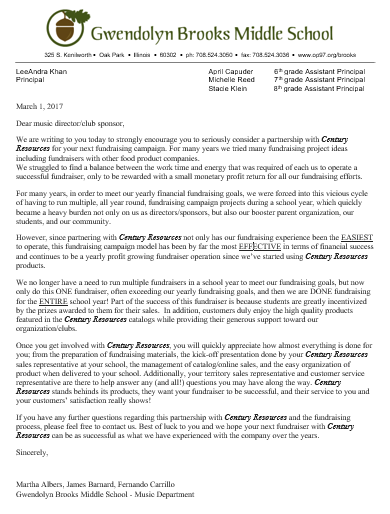 We love hearing from our Customers because that’s how we ensure we’re executing our mission of being an Easy & Effective Fundraising program for secondary schools. What’s even better is receiving letters like we did from Gwendolyn Brooks Middle School Music Department. They’re encouraging other music directors and club sponsors to fundraise with us! We can talk all day about how we can assist you and your groups raise the funds you deserve. In this case, we’ll have Fernando share his experience with us! Fernando Carrillo has been a Music Director at Gwendolyn Brooks Middle School for 14 years. The need to raise funds has been on his “To-Do” list every year. Prior to working with Century Resources Fernando and his group would run about four fundraisers a year! These would consist of Department dinners for parents while the students performed and friends and family would pay to eat. Collaborating with restaurants where they would receive a percentage of the sales that evening. Selling Christmas wreaths as well as poinsettia plants during the holiday season. The list goes on and on. Fernando wanted to provide his students with the opportunities. Such as, guest artists appearances, field trips, as well as fund the reoccurring costs for music, contests and more! This took a lot of time, effort, and MONEY to execute. Include all of the work he and the other directors do and their workload was at an all-time high therefore becoming a heavy burden! Fast forward to today and Fernando and the Gwendolyn Middle School Music Department has been fundraising with Century Resources for almost four years, one time a year. That’s a lot of fundraising yet the funds he raised from all of those fundraisers were still only a fraction of what he has been able to make with the Century Resources program. Since partnering with Century Resources, the Music Department at Gwendolyn Middle School has increased their profit year over year, surpassing their fundraising goal. Fernando sets the tone every year that the Century Resources fundraiser is the only fundraiser they’ll be running for the year. “Getting the community to buy into one fundraiser a year as opposed to four, as well as explaining what the money we’re raising will be used for has really increased our sales!” Students really buy into this fundraising program as they’re awarded prizes for reaching their individual fundraising goal. Fernando finds that emailing his students’ parents as well as utilizing his Facebook group page is the best way to communicate the details of the fundraiser. “We provide due dates as well as examples of what we’ve used the money for in the past and what we plan to use it for this year”. Another key to his success is utilizing the goal charts. Century Resources provides goal charts in order to keep the group on track to raise the funds they need. This year Gwendolyn Middle School Music Department plans to raise funds for recording equipment for their concerts, take a trip to the Rock N Roll Hall of Fame, as well as go on a river boat cruise and visit Cedar Point! We can’t wait to help them reach their goal!